When you hear ‘waxed canvas bags,’ what do you think of ? Maybe you’ve never heard of it before. Maybe you think of outdoors bag for trekking and camping. Maybe you’re already a devout fan. But let me take a moment to talk about the material and why it makes for such good bags and backpacks. 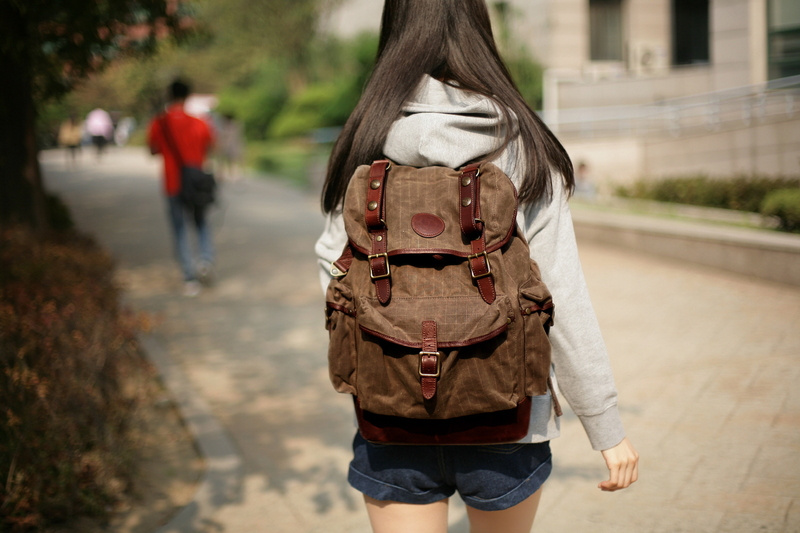 Most bags or backpacks are made of canvas or nylon or some mix. Most outdoors bags are sheer nylon or similar, while daily backpacks are more likely to be more like canvas or woven nylon. When you first hear waxed canvas, you might think it would be sticky or kind of glossy, maybe even unattractively cracking as it ages. That’s definitely not the case. Builford waxed canvas bags and backpacks in particular use original Martexin waxed canvas, which has been through almost a hundred years of testing to get the right formula. It’s not sticky or glossy; in fact, the fabric feels perfectly normal. It’s not completely smooth like nylon, but has a really nice texture that feels strong and pliable. There is no cracking at all, in fact, if you didn’t know it was waxed, you probably couldn’t guess it! But in the tests of time, wear, and water, waxed canvas bags win out. The waxed canvas is durable and protected. It wears well and over a very long time, and wax can always be re-applied. It’s waterproof, which is why it’s been used mostly for outdoors bags and backpacks. But it doesn’t have to be, and that’s where Builford comes in. Builford waxed canvas bags are not just plain old backpacks, they are also fashion items. The same backpack can double as your camping companion, weekend trip pack, and school bag – and more. The waxed canvas builds a natural longevity and resistance into them, and the designers have taken that and run with it, building each bag into an excellent example of the luxury vintage fashion style. I think that’s what I like best about waxed canvas bags. They work so well for the outdoors, but they don’t look like your basic nylon, bright neon backpack. They’re more casual than the backpacks I see these days, which are blocky and fashionable, but don’t hold their shape well and feel strange on your back. I can use them to death and they still look great. The Builford bags especially are just so beautifully designed that I can take them anywhere – they’re casual, yes, but the class of the design and the material in itself makes it feel very sophisticated. To find out more about Builford, check out www.builford.com. Share the post "What’s the deal with waxed canvas bags?" Posted in Blog and tagged Builford waxed canvas, camping backpacks, school backpacks, travel backpacks, wax canvas backpacks, wax canvas bags, waxed canvas, waxed canvas backpacks, waxed canvas bags. Bookmark the permalink.